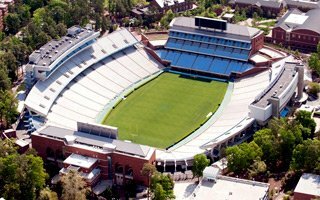 As announced this week by University of North Carolina, Kenan Memorial Stadium will undergo a significant change before the 2018 season. Expected to cost between $6 million and $6.5 million, the operation will see vast majority of the seating replaced. Instead of traditional bleachers (benches) the stadium will become equipped with individual seats with backrests. Apart from increased comfort, the move is expected to decrease capacity drastically, from 63,000 to app. 51,000. The only area in which bleachers won't be removed is the student section behind the west goal. The decrease in capacity could mean sell-out crowds every game. Last season the Tar Heels averaged 50,078 people per game, though this year expectations are high and potential success could increase ticket demand significantly. In order to pay for the seating replacement University of North Carolina is raising ticket prices by $6 each. Carolina’s first home football game is scheduled for Sept. 15.